Although only a small range of Fr numbers was investigated, a relative high range of diameters d is included. However, is it possible to realize the required KLa? We will return to this question in Problem 5. For practical applications, it is necessary to change geometric numbers and to study their influences. Frequently, the influence of relative small variations (e.g. d/D = 4.0 ^ d/D = 3.5) is low and the freedom to move is given. Fig. 5.14 Power correlation Ne = f (Fr) for surface aerator Symplex Type A, Pushing, H/d = 1.0, D/d = 4.37 (Zlokarnik 1975). Fig. 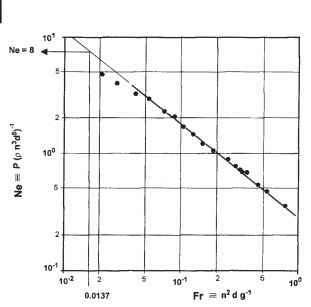 5.15 Sorption correlation Y = f (Fr) for surface Aerator Simplex, Type A, Pushing, H/d = 1.0, D/d = 4.37 (Zlokarnik 1979). 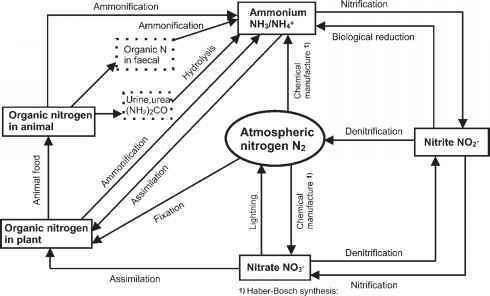 It is very important to prove these methods experimentally with two or three aerators of the same type but different diameters, which differ by a factor of two or three. The same water should be used and all geometric numbers must be the same in all these experiments if the influence of relative small changes has not been studied before. Unfortunately, the expenditure for such experiments is high and such studies are very seldom.